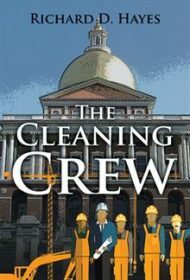 Fed up with incompetence and political graft in Massachusetts, a group of intrepid and accomplished retirees led by two successful businessmen devise a way to turn the tide in Richard D. Hayes’ novel, The Cleaning Crew. Close friends Matt and Jeremy are tired of their state’s progressive government destroying family lives. They decide to hand-select about 50 experts in management and government with the time, money and interest to help build a political action group called The Cleanup Crew to run for all the state’s upcoming elected positions. At first, the Crew isn’t taken seriously. But as it attracts bigger interest, Democratic and Republican party insiders, as well as a shadow figure involved in illegal drugs and money laundering, will stop at nothing—from personal attacks to break-ins to murder—to keep them from office. Hayes, a retired attorney from Massachusetts, offers an intelligently penned novel with well thought out, plausible ideas for political reform, right down to how these ideas would be sold in speeches. Character development is equally sound. However, the plot is more explanatory and situational than dramatic. Even when lives are threatened, there’s little tension or the sorts of details that would draw readers into the action. (For example, the murder is only mentioned in passing without showing the action of the deed.) The author’s fictionalized account predominantly serves less as a heady thriller than a vehicle for offering ideas for change. As a result, the audience for this book most likely will be those fed up with the current state of politics seeking a guidepost toward taking action, rather than those looking for a nail-biting suspense story.